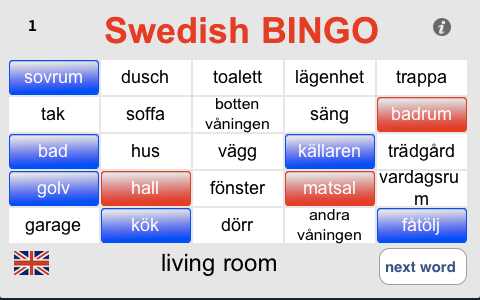 The Swedish Bingo iPhone application: improve your Swedish by playing bingo! You'll see a grid much like a bingo game. An English word appears at the bottom: match it to the Swedish word on the bingo board. Get five correct matches horizontally, vertically or diagonally to win and move on to the next level. 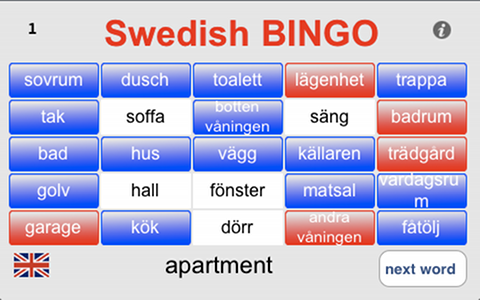 Each time you press a bingo tile, our Swedish speaker pronounces the selected word. The three current levels cover the home, the kitchen, and clothing, with more to come! Play just once and you'll be shouting "Skål!" Animated win screens that highlight Swedish cultural icons help introduce you to some fun and funky Swedish history. Whether you'd like to prepare for an upcoming trip to Stockholm, or brush up on the way to chat with your relatives, Swedish Bingo is a great addition to any coursework in a language class, as well as a quick study to improve your existing Swedish skills. Why study with boring static word lists? Instead, play a fun and engaging game. A key benefit to Swedish Bingo is that you also learn by sound, not just by reading. That tricky Swedish vowel pronunciation becomes a bit more manageable after a few rounds of play. Clear audio with precise pronunciation ensures that your Swedish will astound and impress even the most hip clubber from the Söder. Contact us with comments and suggestions about new word lists, new results screens, new languages - even new interfaces. Use the in-game contact link, or email us at bingueau@gmail.com. Improve your French while Playing Le Bingueau! Improve your Russian while playing бинго! Håkan Dahlström- recorded the audio prompts and consulted on content. You can contact him via Anna.